After an 8K TV-filled IFA, videophiles are getting treated to a second AV-focused conference called CEDIA that starts on September 4. 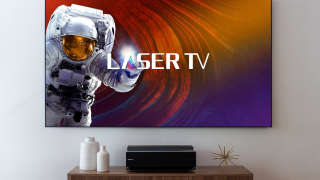 To open the show, Hisense has announced two new series of Laser TVs, the L10E 4K Ultra Short Throw Dual Color Laser TV Series and the L8E Series Ultra Short Throw Laser TV. The former is a 4K projector TV hybrid that offers both wide color gamut and HDR in a 100-inch or 120-inch area while the former reaches a maximum size of 88-inches and tops out at 1080p. The Dual Color bit of the name comes from Hisense’s unique use of two laser diodes - one red and one blue - to “drive stunning images onto a specially designed, ambient light rejecting, screen.” That should allow the Hisense Laser TVs to go where traditional projectors can’t (like brightly lit rooms) and should give better clarity even when you’re sitting close to the screen. To that end, while projectors have often been seen as the larger - but less clear - of the two display types, Hisense has been working to make resolution and clarity the cornerstone of its Laser TV projectors, and have even worked to bring down the cost to a more consumer-friendly level. … but consumer-friendly still doesn’t mean cheap. According to Hisense, the Laser TVs will start at $3,799 (around £2,950, AU$5,300) and will be available for pre-order starting at CEDIA 2018.